Patrick grew up in Hilo and graduated from Waiakea High School in 2012. 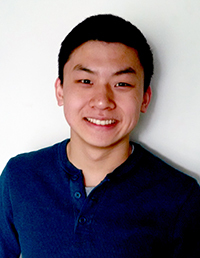 He is currently studying Mechanical Engineering at Northwestern University in Evanston, Illinois, and will begin his junior year this fall. At Northwestern, he is involved in Formula Racing, Club Swimming, and Hawai‘i Club. After graduating, Patrick plans to pursue graduate studies in mechanical engineering and then work in industry. Project Abstract: The primary mirror of the Thirty Meter Telescope (TMT) is composed of individual 1.4-m hexagonal mirror assemblies, called Polished Mirror Assemblies (PMA). Each PMA consists of the mirror and a support structure called an SSA (Segment Support Assembly). 574 PMAs will be manufactured in several stages in various global locations before finally arriving on Mauna Kea. The main focus of this project was to design a specialized shipping container to protect both SSAs and PMAs from shock, vibration, and environmental factors during transport and storage. Several design weaknesses were identified in TMT’s existing “box-in-a-box” concept for the PMA/SSA shipping container: it was excessively large, could not be stacked, and took several hours to unload. The new design achieves significant size and weight savings by abandoning the double-box design in favor of a single box with a more robust structure and improved cushioning system, resulting in a similar level of protection with lower production and shipping costs. The smaller, lighter, reinforced box structure allows safe stacking of up to three units. Measures were also taken to improve the adjustability and user-friendliness of the interior immobilization system, which prevents the PMA or SSA from shifting around in the container during transit. Furthermore, the immobilization system was made completely removable to minimize the risk of damage during PMA/SSA insertion. The reduced size and simplified interior restraints greatly expedite the unloading process. In addition to the design of the container, the project also involved finding potential manufacturers for these containers in India, where they will be mass-produced.